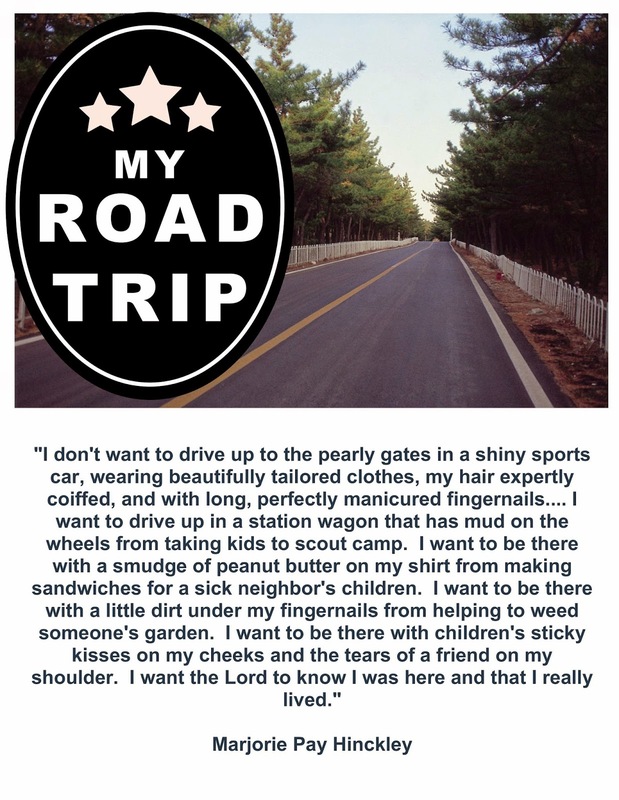 My Road Trip - who I want to be in my life; how to forgive people, and how to love them regardless. I can honestly say that I have been extremely blessed in my life with people surrounding me that love me. I went through a somewhat abusive situation in my younger years, in fact I can think of a couple of them, and I have had my struggles getting over them. It isn't an easy thing to do. I actually thought I was doing pretty good at handling them, until a few days ago, I was in a situation that tested me and I failed miserably. I was walking into a room full of people and I thought I saw a person in that room that had at one point in my life, offered me some pretty extreme verbal abuse. I thought until that moment that I had forgiven that person, and that I was okay to be in the same room with them, if that situation ever came up. Well thankfully I mistook someone else for this other person, and I panicked. I couldn't go into the room. I froze. Okay, so I still have some work to do to get over this. What a tough thing. I still love this family member dearly, but am terrified of letting this person in again, because I am afraid of what might happen. How sad. I want to have all of my family be a part of my life. How is it that we can let other people control our lives to this extent? We must fight it and learn to get over it, and love again. We can turn our hearts to the example of the Savior who showed love and compassion on everyone, even after they placed Him on the cross. He still asked the Father to forgive them because they didn't know what they were doing. I guess I have some more turning my heart to get to this point. To really understand love and forgiveness like He did. None of us are perfect. We can love others though. We can rise above the situations we might find ourselves in and be better. We can love people. We can trust people. There are good people in the world. We just need to seek them out. They won't be hard to find if we are looking in the right places. The right places – I think we can all figure out what those places are. Learn to love again, because the world needs people who love people. Here is a great way to find people to love: “In your morning prayer each new day, ask Heavenly Father to guide you to recognize an opportunity to serve one of His precious children. Then go throughout the day looking for someone to help.” M. Russell Ballard. I guarantee that if you will find people to help, you will find some of the dearest friends to love in your life. You will also find that you will love yourself. "I don't want to drive up to the pearly gates in a shiny sports car, wearing beautifully tailored clothes, my hair expertly coiffed, and with long, perfectly manicured fingernails.... I want to drive up in a station wagon that has mud on the wheels from taking kids to scout camp. I want to be there with a smudge of peanut butter on my shirt from making sandwiches for a sick neighbor's children. I want to be there with a little dirt under my fingernails from helping to weed someone's garden. I want to be there with children's sticky kisses on my cheeks and the tears of a friend on my shoulder. I want the Lord to know I was here and that I really lived."